Sun spots or hyperpigmentation is very common. Almost all women experience some sort of hyperpigmentation (areas of the skin that is darker than the rest). The most common causes are sun damage, hormonal issues and acne scarring. Athought there is no overnight solution to treating sun spots, there is pleanty of remedies that can help lighten them. Today I am sharing a tried and true natural remedy that if used consistently can help make a difference in those pesky spots. Apple cider vinegar contains natural alpha hydroxy acids, which are known to help lighten sun and age spots. Lemon juice contains citric acid which can also help lighten darkened areas of the skin. 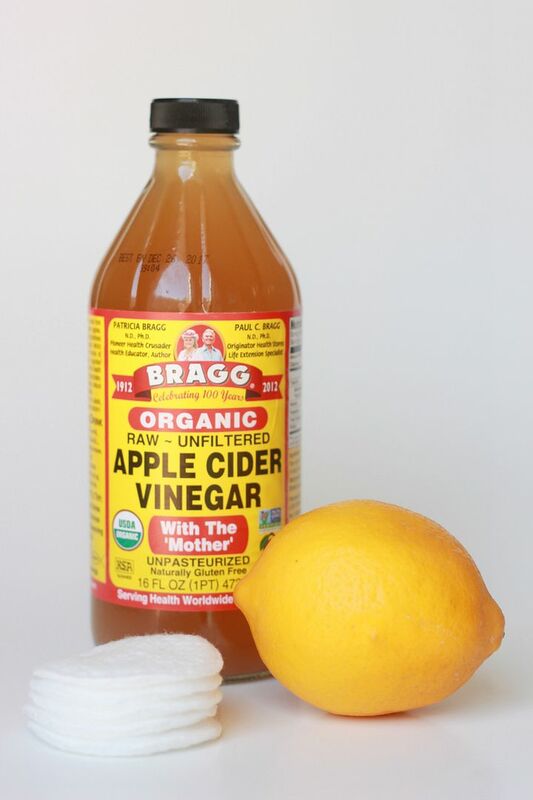 -Every night saturate a cotton ball with about 1/4 tsp of apple cider vinegar and 1/4 tsp of lemon juice. Starting at forehead and working down apply evenly all over face. It is normal to experience a little redness or stinging at first (just like you would with a toner). If you have sensitive skin, or if it feels too strong dilute with water. For best results do not rinse and leave on overnight. Also, make sure you wear sunscreen everyday since this treatment will make you more sensitive to sun exposure. Please keep in mind this is a natural remedy and you will need to use this consistently for at least 6 weeks to see a difference. You can also use this with the diy vitamin C mask for ultimate results. If you try this, please keep me posted on your progress! Could making a mix of this help or does it need to be made freshly every time you use it? Thanks. I have hyperpigmentation and always struggled with finding something that works for me. I will give this a try! Great idea – although I'm headed to the beach in a couple weeks so I won't be doing myself any favors ;) Going to hang onto this remedy! wow..thanks so much for this natural remedy! years of under-protection against UV rays (sunscreen tends to give my extremely oily and acne prone skin breakouts) has given me countless sun spots. Vitamin C serums for some reason cause me breakouts too, so I'd be keen to try this apple cider concoction! Thank you for sharing! I need to try this! Would this work on darker spots that are a result of acne scarring as well? Or just sun-related dark spots? Another old fashion skin lightener is "plain yogurt". Put it on skin at night after cleansing, just slightly, not so your face is white. It also takes a little bit of time to see results. This sounds good. I'd like to try it. Just one question though. I use a nightly serum with retinol and other ingredients from Osmosis skin care. Do I put the spot remedy on first and then the serum? i have a wealth of limes at the moment. Can I use lime juice instead of lemon juice? Melinda- if you are consistent it can help with acne scarring. Anonymous- yes, this can help with pregnancy induced melasma (dark spots). citychick27- For this recipe to be effective it does need to be lemons. Hi there...I'm thinking that the ACV and lemon juice are supposed to be combined to use this correctly? And if so, and used to stay on overnight, should I use a moisturizer afterwards? Also, can I use this along with the Oil Cleansing Method that I use for my cleansing routine? Thanks so much! does this work on depigmentation? Been using this for two weeks and see results already. Thank you so much!! I have a very ugly face,I hate my face and don't like to be in public. My face is full of dark spots I have a very sensitive skin,I must try this. I tried only lemon juice but it makes my face red and burning. This concoction is burning my skin and causing red irritation. Shouldn't this be diluted with some water? it bleaches the areas you do NOT want bleached. I've been doing this for three consecutive nights before bedtime and have kept it on through the night...I'm already seeing a very noticeable difference! THANK YOU! If I make a batch ahead of time to store in the fridge, do I just do equal amounts of vinegar and lemon? Thanks! I Don't Have Apple Cider Vinegar. But I Do Have Distilled White Vinegar. Is It Fine To Use? It's very drying to my skin even when applying moisturizer afterwards.... Any suggestions? I have been always trying to lighten those dark spots on my face (while those spot lightening products are kind of pricey). This apple cider vinegar+lemon juice is so simple, natural and exactly what I'm looking for. Will definitely try it, thanks for sharing! I use distilled white vinegar and lime juice every other night. I can see the diference my dark spots are getting lighter. It works great! Most of you are thanking her for the suggestion and say that you will try it. Does it work? If so, how long before seeing noticeable results? do you apply the mixture to the whole face or just on the sun-spots? I have very sensitive skin also, any tips? Can this be used all over the body ? I have the same question on applying to the whole face or just spots? I am going to try this. I have sensitive skin will update progress of results soon. Tx for recipe...Florida girl. Hi! Isn't this too strong for every night use? I also don't understand how I should use it. After I wash my face I should apply the mix and leave it for all night. But if I don't use moisturizer, my face will get dry and burn. Can you help me with this? I've never used it with lemon juice but the acv water combo I use as a toner has dramatically reduced my acne scarring!!! I'll have to try adding in the lemon juice to see if that helps even more!